Hardly anyone in L.A. has heard of Austin Beutner. But for more than a year he has been arguably the most powerful person in the city—so powerful that some say he has eclipsed his boss, Mayor Antonio Villaraigosa. He’s even considering the next step: running for mayor himself in 2013. It’s an ambitious goal for any local politician but especially for a newcomer who’s, well, not a politician. Fifteen months ago Beutner, a former Wall Street prodigy, didn’t know the mayor. After just three meetings with Villaraigosa, he was charged with managing a vast swath of the city. The mayor came up with a new title for him—first deputy mayor—along with a new office called Economic and Business Policy. He also gave him a hefty mandate: Create jobs, attract businesses, and improve the local economy. 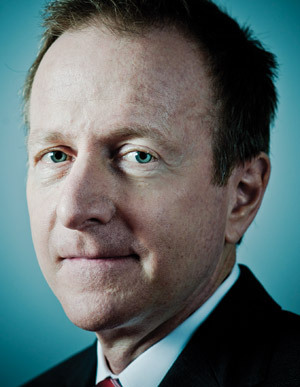 Beutner, who had decades of experience in investment banking but none in local government, was granted oversight of 12 city agencies, from the Port of Los Angeles to the Housing Authority. That’s 17,000 employees. His pay: $1 a year. Still, Beutner’s reign has left people wondering. “Whom do you listen to?” asked City Councilman Ed Reyes. “Do you listen to the mayor? Or do you listen to Austin?” For many it has been a dizzying spectacle. “I don’t know if the mayor purposefully stepped aside to let Austin do his job or whether Austin just walked in there and said, ‘Get out of my way,’ ” says outgoing city councilman Greig Smith. The council wields considerable power under the city’s charter and often sees itself as a rival to the mayor’s office. Beutner’s private sector mentality, however, has made relations frostier than usual. He seems to have little tolerance for being second-guessed by a bunch of politicians. “He could barely conceal his disdain for us,” Smith says. Beutner makes no secret of his disregard for the council. “Look at what the city council is up to. The city is broke, and they’re holding hearings on Billy the Elephant,” he says, referring to the battle over the zoo’s new pachyderm enclosure. Beutner’s path to public service began on a dirt trail in the Santa Monica Mountains. In 2007, during an early-morning bike ride, he crashed and awoke in a pool of blood. Some joggers found him. He’d broken his neck and needed to be airlifted out. He had been a rising star on Wall Street. Raised in Grand Rapids, Michigan, he became an investment banker after attending Dartmouth. At 29 he was the youngest partner ever at the financial firm Blackstone. By 33 he had made “enough money not to have to work for the rest of my life,” Beutner says. So he took a detour, working two years in Russia for the State Department. He returned to Wall Street in 1996 to found the investment bank Evercore Partners with Roger Altman, former deputy secretary of the Treasury. When it went public in 2006, Beutner made more than $100 million from the IPO alone. Beutner came to L.A. to run Evercore’s West Coast office, settling with his wife and four young children in the Pacific Palisades. After breaking his neck, he found that the world of high finance had lost its appeal. He retired and spent months traveling with his family. By the fall of 2009, he began to scout for new challenges. He discovered his opportunity at a power breakfast held at former mayor Richard Riordan’s Brentwood home. It was December 2009, and the Los Angeles economy was in the tank. The city’s unemployment rate was (and remains) above 12 percent. Business leaders were frustrated by what they say was Villaraigosa’s feckless response. “There is this overall sense, fair or not, that the mayor talks big but doesn’t produce,” says George Kieffer, a partner at the influential Los Angeles law firm Manatt, Phelps & Phillips. Companies, thwarted by burdensome regulations, were leaving the city. Riordan wanted to bring together some of the most prominent people in L.A. to see what could be done. Among those attending were Michael Milken, Eli Broad, and Disney senior executive Jay Rasulo, along with Kieffer, City National Bank chairman Russell Goldsmith, and Jay Carson, who was chief deputy mayor at the time. Beutner also had a seat, though few of the guests knew him well. One after the other they rattled off ways to address L.A.’s most glaring problems: slash the lengthy business permitting process, do away with arcane business taxes, tackle runaway pension costs. Then Beutner spoke up. The proposals were all fine, he said, but until a person inside city hall is charged with implementing them, nothing would change. Those present took notice. Carson arranged a meeting between Villaraigosa and Beutner about a possible job in city hall. The mayor was impressed. He became more impressed when Beutner told him his salary demand. “We can get someone like this for one dollar a year?” Villaraigosa recalls asking. Beutner wanted to make sure he would have enough latitude to have an impact. “Make sure you get something in writing from the mayor,” Broad cautioned. A confidential letter would outline their relationship. On January 11, 2010, Villaraigosa introduced Beutner to the public. The press release trumpeted that he would “change the City’s approach to job creation and economic development” and be given “a large portfolio with unprecedented oversight of City resources.” To observers it sounded like the latest reshuffle in an administration that had made many promises but delivered on few. Only days earlier Northrop Grumman, the nation’s second-largest defense firm, announced it was moving its headquarters from Los Angeles to Virginia. The Chinese electric car and battery manufacturer BYD had been considering L.A. as a possible U.S. headquarters. It all but gave up after learning of the red tape involved. Beutner summoned his department heads to a meeting where the city would try to pitch itself one last time. He set the ground rules for his staff. BYD would go through its wish list. Only two responses would be acceptable: “Yes, we’ll do that” or “Yes, we’ll look into that.” Saying no was off the table. Beutner tried to sweeten the deal by promising that the mayor would ride in one of the cars when he goes to the Academy Awards (this has yet to happen) and that a BYD vehicle would be prominently displayed at LAX. The company changed course and is now opening an office downtown that could have a staff numbering up to 150. In certain ways Beutner has been simply cleaning up after the man who hired him. In 2008, Villaraigosa and Eric Garcetti, the city council president, launched the “12 to 2” program, which was designed to slash the city’s bureaucratic thicket by reducing the number of agencies involved in permitting from a dozen to two. Beutner called a meeting of all the people who had been working on the program. “The conference room was empty,” he remembers. Despite the hype, Beutner determined that no one had done a thing. He hired a consultant to design a system that’s supposed to be faster and more transparent. Until it rolls out, city workers are being assigned to guide applicants through the permit process. Curtis Fralin, proprietor of the historic Crenshaw District soul and jazz club Maverick’s Flat, says, “I wouldn’t be open if it weren’t for Austin.” Fralin’s plans to relaunch the establishment became mired in bureaucracy and funding troubles. Beutner had someone help him through each step. “They would walk me over to Building and Safety, walk me over to Health,” says Fralin. The time it takes to permit a restaurant has been cut in half, but many still think that’s too long. While Beutner won respect as a manager, he’s an unknown quantity as a politician. His voting registration declines to state any party affiliation. The field already seems crowded with veterans—Garcetti, Controller Wendy Greuel, County Supervisor Zev Yaroslavsky, among others, are all considering a run—who will be able to play up what they’ve achieved in office. Beutner says he’s not intimidated by what he refers to as a group of “tenured insiders.” The city has been so poorly managed, he maintains, that the current crop of elected officials don’t have much to run on. “I’d be delighted to match my track record against theirs,” he says. City Councilman Bernard Parks, who squeaked by to avoid a runoff in the last election, says it’ll be “a crapshoot.” He wonders whether Beutner is ready to forfeit his privacy and undergo the scrutiny of a citywide campaign. Riordan remembers facing similar questions when he first ran for mayor. But he notes that Beutner is a lot wiser after his time at City Hall. “I had less experience then than he does right now,” says Riordan. No matter what happens, Villaraigosa says he wants someone doing Beutner’s job. After all, someone’s got to run the city.